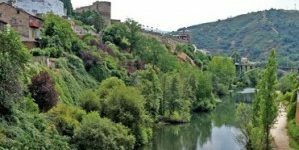 The history of Ponferrada, on the French Way, is linked to the Camino de Santiago from its very origins, as the town developed as a settlement on the road to Santiago in the Middle Ages. 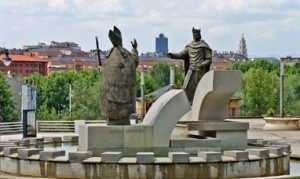 Bishop Osmundo from Astorga ordered to build a bridge over the Sil River in the 11th Century to help pilgrims cross the river on their way to Santiago de Compostela. Iron reinforcements would be later added to the ancient bridge, giving the city its current name: Ponferrada comes from ‘Pons Ferrata’ meaning Iron Bridge in Latin. The ancient bridge was the centre of the original village: “Puebla de San Pedro”, Saint Peter village, named after the 12th century church built after the bridge.The village was joined by the settlement set up by Fernando III, King of León, on a rocky hill on the other side of the river. The settlement would expand over the centuries and become the Templars castle, home to monks and feudal lords. In the 12th century, during the reign of the King and Queen of León, the Templars settled along the road to Santiago. The town of Ponferrada was donated to the Templars by King Alfonso IX so they would protect pilgrims en route to Compostela. Today, Ponferrada, in the heart of El Bierzo valley and surrounded by mountains, is the last city on the French Way before Santiago de Compostela.